I recently received this lovely pink fluffy sweater from The Little Black Dress webshop. I was allowed to pick out an item and I immediately fell in love with the baby pink color. I was already thinking that my wardrobe could use a baby pink sweater, so I’m really happy with it! It feels so soft and it looks so fluffy and huggable. I really love that in this cold season! The idea behind The Little Black Dress webshop has everything to do with the LBD. Beautiful, timeless items, which you can combine with everything and will last a long time. And of course, the Little Black Dress is the most famous example of such an item! Many women struggle with the problem of having a lot of clothes, but still feeling like you have nothing to wear. This happens because most of the items can’t be worn with each other. Or because a lot of the items we buy are actually only a trend for a couple of months. The Little Black Dress webshop solves this problem by offering qualitative clothing pieces, which are timeless and easy to mix and match. Therefore the site also offers inspiration on how to wear the items. 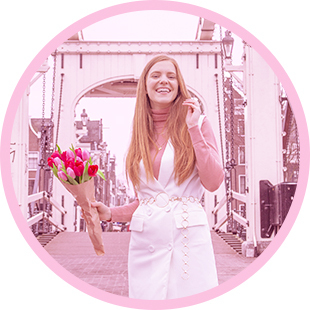 The webshop mainly focuses on young, ambitious women and for the most part they sell Scandinavian clothing by labels like Nümph, where my sweater is from! But you can also find Mads Norgaard, Minimum, Mae & Ivy and Dr. Denim in their webshop. Very logical if you ask me, because Scandinavian women are very well known for their superfashionable outfits with timeless basics!